Research to develop therapy for retinal degenerative diseases has garnered interest beyond the field of ophthalmology and vision research because of the unique accessibility of the human retina (which is part of the central nervous system) and progress in identifying gene mutations leading to retinal degeneration. Diseases of inherited retinal degeneration typically lead to severe visual impairment or blindness early in life and this disease group is the leading cause of legal blindness among working age adults in e.g. England and Wales, having replaced diabetic retinopathy (1). 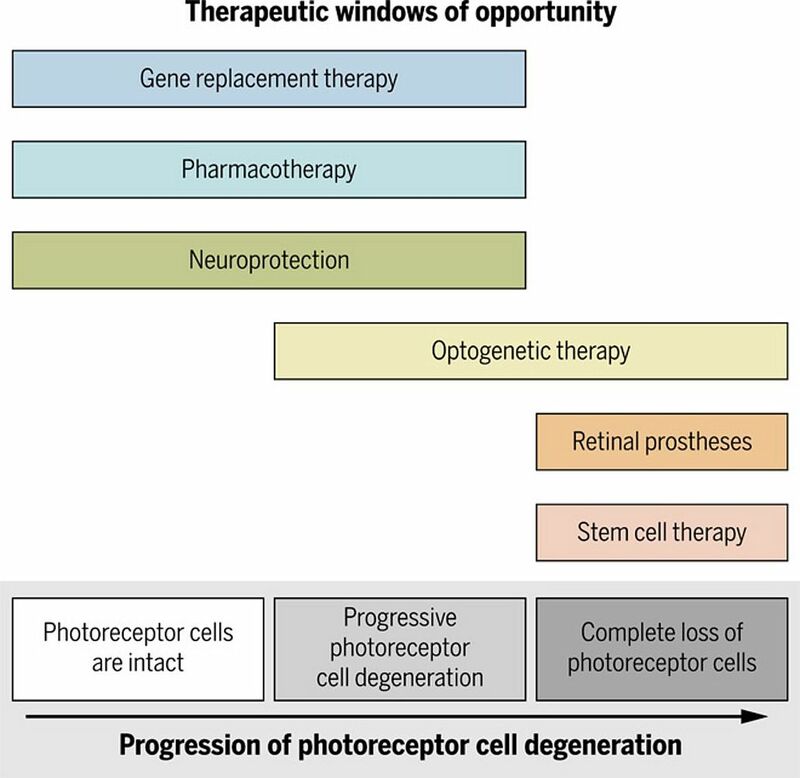 Therapeutic options are currently limited, as is the case for many neurodegenerative diseases, but new therapeutic approaches including gene therapy, stem cell therapy, optogenetics, and retinal prostheses are being developed. Many of these approaches have entered the clinical phase of development (Fig. 1). Figure 1. Different strategies for treating retinal degeneration. Gene replacement therapy is appropriate during the early stages of disease when retinal photoreceptor cells are still intact. Pharmacotherapy and neuroprotective strategies are the best approaches to use to treat disease with ongoing photoreceptor cell degeneration. Stem cell therapy, optogenetic therapy and retinal prostheses are needed to restore vision during the later stages of retinal degeneration. Stargardt macular dystrophy is an example of a retinal degenerative disease where gene therapy, pharmacotherapy and stem cell therapy are being tested in early clinical trials. Clinical trials for inherited retinal degenerative diseases are likely to require special considerations with respect to outcome measures. In these retinal diseases, peripheral and central vision may both be affected, either in a centrifugal (affecting the macula initially, and the periphery later) or centripetal (affecting the periphery initially) manner. Therefore, outcome measures must be chosen according to the specifics of the trial design and the aim of the intervention (i.e. restoring vision or slowing down retinal degeneration) (4). The outcome measures should have high reliability and repeatability and permit standardization across study sites using established normative data. They should derive from tests that are ideally noninvasive, safe, easy and quick to perform so as to minimize the burden placed on both patients and staff (5). Visual acuity has been the primary outcome measure for efficacy evaluation in most treatment trials for retinal diseases, but only a change of ≥ 15 letter scores (equivalent to ≥3 lines on a standardized visual acuity chart) is considered significant (6). In inherited retinal degenerative diseases with diffuse generalized photoreceptor cell loss such as in retinitis pigmentosa (RP), visual acuity typically declines slowly and may only be affected in late stages when the damage begins to involve cone photoreceptor cells in the very center of the retina. In a recent study using adaptive optics scanning laser ophthalmoscopy (AOSLO), good visual acuities (≥ 80 letters corresponding to 20/25 or better) were still maintained in patients with retinal dystrophies while cone densities in vivo were 52% below normal (7). AOSLO imaging capabilities have improved sufficiently to allow visualization of the retina at cellular resolution (8), however, further refinements to enhance resolution, reliability and repeatability are needed before AOSLO can be used in clinical trials. Spectral-domain optical coherence tomography (SD-OCT) delivers tomographic images of retinal layers with a resolution similar to that of histological tissue sections (Fig. 2) (9). Figure 2. Advanced non-invasive imaging of the retina. (A) The retina can be imaged using spectral-domain optical coherence tomography (SD-OCT, black box) and adaptive optics scanning light ophthalmoscopy (AOSLO). (B) Shown is a SD-OCT tomographic section of the retina through the foveal area in a healthy subject. The retinal lamina can be visualized and quantified leading to surrogate marker endpoints. Photoreceptor cells (white boxes) can be visualized at cellular resolution with AOSLO. (C-E) AOSLO images of rod and cone photoreceptor cells from the same subject at two different locations (scale bar 75 µm). (C) Single cone and rod photoreceptor cells are visible. Based on different reflectivity, they may appear brighter or darker as shown in D. (E) At the fovea of the retina, cone photoreceptor cells are densely packed. Images were acquired using a custom-built AOSLO device at Moorfields Eye Hospital, London, UK, and are courtesy of M. Michaelides and A. Dubis). This imaging modality, in combination with segmentation analysis, also provides quantitative measures of retinal structure that facilitate the precise tracking of disease progression (10, 11). 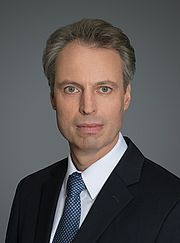 Further refinements have led to the development of OCT angiography, a pioneering noninvasive technique based on a highly efficient split-spectrum amplitude-decorrelation angiography algorithm (12). This technique provides information about both retinal and choroidal vascular blood flow and is particularly useful in evaluating vascular dysfunction (12). Such in vivo high resolution imaging modalities promise to enhance early diagnosis and may provide surrogate markers to monitor the efficacy of therapies. For example, in three patients with RP treated over a two-year period with CNTF, AOSLO imaging was applied to evaluate the structure and distribution of cone photoreceptor cells and revealed reduced rates of cone loss in the CNTF-treated eye of patients compared to the contralateral sham-treated eye. In contrast, there were no significant changes in visual acuity, visual sensitivity and electroretinography responses (13). The U.S. Food and Drug Administration (FDA) recommends visual function changes as a primary endpoint in measuring the efficacy of any new compound for treating eye diseases, but may consider anatomical markers such as the area of RPE atrophy measured by autofluorescence of the fundus (14). Indeed, to serve as a surrogate endpoint, a marker must be ”reasonably likely, based on epidemiological, therapeutic, pathophysiological, or other evidence, to predict clinical benefit” (14), and the best surrogate endpoint is a marker that changes along with clinical endpoints (14). In vivo imaging of the retina at histological-level resolution could be combined with functional high-resolution mapping, for example using microperimetry, to establish structure-function correlations that would enable the establishment of structural endpoints and the development of new outcome measures (15). New software tools like visual field and modeling analysis (VFMA) can help to create topographical models of the hill of vision derived from microperimetry and static visual fields in order to aid the visualization of field defects and quantify the magnitude and extent of loss of retinal sensitivity (16). In a clinical trial, volumetric static analyses showed greater power for detecting changes to the retina compared to kinetic perimetry (3). Such an approach of structure-function correlation has been implemented in one of the largest natural history studies to date in the field of inherited retinal degenerative diseases: The Natural History of the Progression of Stargardt Disease: Retrospective and Prospective Studies (ProgStar, NCT01977846) (17-23). G. Liew, M. Michaelides, C. Bunce, A comparison of the causes of blindness certifications in England and Wales in working age adults (16-64 years), 1999-2000 with 2009-2010. BMJ Open 4, e004015 (2014). A. V. Cideciyan, S. G. Jacobson, W. A. Beltran, A. Sumaroka, M. Swider, S. Iwabe, A. J. Roman, M. B. Olivares, S. B. Schwartz, A. M. Komaromy, W. W. Hauswirth, G. D. Aguirre, Human retinal gene therapy for Leber congenital amaurosis shows advancing retinal degeneration despite enduring visual improvement. Proc Natl Acad Sci U S A 110, E517-525 (2013). R. G. Weleber, M. E. Pennesi, D. J. Wilson, S. Kaushal, L. R. Erker, L. Jensen, M. T. McBride, T. R. Flotte, M. Humphries, R. Calcedo, W. W. Hauswirth, J. D. Chulay, J. T. Stout, Results at 2 Years after Gene Therapy for RPE65-Deficient Leber Congenital Amaurosis and Severe Early-Childhood-Onset Retinal Dystrophy. Ophthalmology 123, 1606-1620 (2016). H. P. N. Scholl, J. A. Sahel, Gene therapy arrives at the macula. Lancet 383, 1105-1107 (2014). D. A. Thompson, R. R. Ali, E. Banin, K. E. Branham, J. G. Flannery, D. M. Gamm, W. W. Hauswirth, J. R. Heckenlively, A. Iannaccone, K. T. Jayasundera, N. W. Khan, R. S. Molday, M. E. Pennesi, T. A. Reh, R. G. Weleber, D. N. Zacks, Advancing therapeutic strategies for inherited retinal degeneration: recommendations from the Monaciano Symposium. Invest Ophthalmol Vis Sci 56, 918-931 (2015). R. W. Beck, M. G. Maguire, N. M. Bressler, A. R. Glassman, A. S. Lindblad, F. L. Ferris, Visual acuity as an outcome measure in clinical trials of retinal diseases. Ophthalmology 114, 1804-1809 (2007). K. Ratnam, J. Carroll, T. C. Porco, J. L. Duncan, A. Roorda, Relationship between foveal cone structure and clinical measures of visual function in patients with inherited retinal degenerations. Invest Ophthalmol Vis Sci 54, 5836-5847 (2013). J. Carroll, D. B. Kay, D. Scoles, A. Dubra, M. Lombardo, Adaptive optics retinal imaging--clinical opportunities and challenges. Curr Eye Res 38, 709-721 (2013). G. Staurenghi, S. Sadda, U. Chakravarthy, R. F. Spaide, Proposed lexicon for anatomic landmarks in normal posterior segment spectral-domain optical coherence tomography: the IN*OCT consensus. Ophthalmology 121, 1572-1578 (2014). D. G. Birch, K. G. Locke, Y. Wen, K. I. Locke, D. R. Hoffman, D. C. Hood, Spectral-domain optical coherence tomography measures of outer segment layer progression in patients with X-linked retinitis pigmentosa. JAMA Ophthalmol 131, 1143-1150 (2013). R. W. Strauss, B. Munoz, Y. Wolfson, R. Sophie, E. Fletcher, M. G. Bittencourt, H. P. N. Scholl, Assessment of estimated retinal atrophy progression in Stargardt macular dystrophy using spectral-domain optical coherence tomography. Br J Ophthalmol 100, 956-962 (2016). M. Battaglia Parodi, L. Pierro, M. Gagliardi, R. Lattanzio, G. Querques, F. Bandello, Optical Coherence Tomography Angiography in Dystrophies. Dev Ophthalmol 56, 159-165 (2016). K. E. Talcott, K. Ratnam, S. M. Sundquist, A. S. Lucero, B. J. Lujan, W. Tao, T. C. Porco, A. Roorda, J. L. Duncan, Longitudinal study of cone photoreceptors during retinal degeneration and in response to ciliary neurotrophic factor treatment. Invest Ophthalmol Vis Sci 52, 2219-2226 (2011). K. G. Csaky, E. A. Richman, F. L. Ferris, 3rd, Report from the NEI/FDA Ophthalmic Clinical Trial Design and Endpoints Symposium. Invest Ophthalmol Vis Sci 49, 479-489 (2008). P. Charbel Issa, E. Troeger, R. Finger, F. G. Holz, R. Wilke, H. P. Scholl, Structure-function correlation of the human central retina. PLoS One 5, e12864 (2010). R. G. Weleber, T. B. Smith, D. Peters, E. N. Chegarnov, S. P. Gillespie, P. J. Francis, S. K. Gardiner, J. Paetzold, J. Dietzsch, U. Schiefer, C. A. Johnson, VFMA: Topographic Analysis of Sensitivity Data From Full-Field Static Perimetry. Transl Vis Sci Technol 4, 14 (2015). R. W. Strauss, A. Ho, B. Munoz, A. V. Cideciyan, J. A. Sahel, J. S. Sunness, D. G. Birch, P. S. Bernstein, M. Michaelides, E. I. Traboulsi, E. Zrenner, S. Sadda, A. M. Ervin, S. West, H. P. N. Scholl, The Natural History of the Progression of Atrophy Secondary to Stargardt Disease (ProgStar) Studies: Design and Baseline Characteristics: ProgStar Report No. 1. Ophthalmology 123, 817-828 (2016). E. M. Schönbach, M. A. Ibrahim, R. W. Strauss, D. G. Birch, A. V. Cideciyan, G. A. Hahn, A. Ho, X. Kong, F. Nasser, J. S. Sunness, E. Zrenner, S. R. Sadda, S. K. West, H. P. N. Scholl; ProgStar Study Group (2017) Fixation Location and Stability Using the MP-1 Microperimeter in Stargardt Disease (ProgStar Report No. 3). Ophthalmology Retina. 1: 68-76. R. W. Strauss, B. Muñoz, A. Ho, A. Jha, M. Michaelides, S. Mohand-Said, A. V. Cideciyan, D. Birch, A. H. Hariri, M. G. Nittala, S. Sadda, H. P. N. Scholl; ProgStar Study Group (2017). Incidence of Atrophic Lesions in Stargardt Disease in the Progression of Atrophy Secondary to Stargardt Disease (ProgStar) Study: Report No. 5. JAMA Ophthalmol. 135: 687-695.